Aw, these are wonderful. 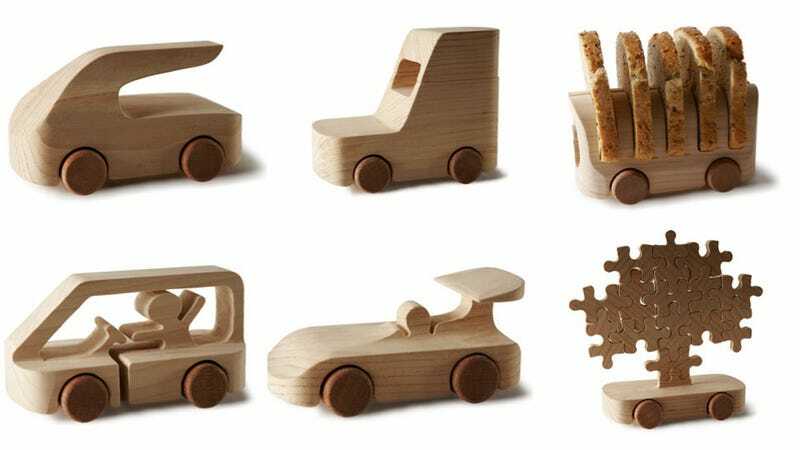 One hundred different architects and designers have each put their own creative spin on a small wooden car for 100% ToBeUs, a traveling exhibition of super minimal mini-roadsters. Architect Matteo Ragni rounded up a who's-who of big names to contribute, from the Campana brothers to BarberOsgerby to Matali Crasset to Marcel Wanders, and the results? Well, they're all completely adorable and awesome, and I kinda want to be sitting on the carpet surrounded by a whole motorcade to play around with. There's something really lovely about the tactile nature of a plain old piece of wood that will weather with time and get a nice patina from all the domestic traffic and floor-bound adventures.